Discussion in 'Deck Help and Strategy' started by Flygon999, May 4, 2008. Start with, well, Pachirisu ofcourse. Get out a Shuppet, 1-2 Baltoys, and 2-3 Eevees. Get out Claydol and build up Glacion Lv.X, or, Banette if facing a G&G deck. There are a lot of Pokemanz so I was wondering if I should cut down on the Banette line or not. don't you think there to many pokemon, you would need to put some out. Flygon999, you have an amazing talent for butchering really good decks. Just having Eevee, Pachirisu and a Banette line all in the same deck is just silly, and I think it shows a lack of knowledge of how to use these effectively on your part. Then, talk about WAY too much clutter and lack of good setup as well as way too much TO set up, and a bad trainer/supporter base. Man, even the ratios of pokes and energies are bad, and you aren't even using the right energies at that. I'm sorry, but as an original player of Arithmetic for Jimmy Ballard, this just makes my eyes bleed. I have to be frank and say that you have little to no idea what Arithmetic is and what made it good. This isn't Arithmetic at all. I really don't know why you would call it that. Just because there's Banette in it? This deck is not like Arithmetic at ALL. there are wayy to many pokemon for 1 thing, the deck is very inconsistant, and JUST BECAUSE THERE IS CLAYDOL AND BANETTE IN THE DECK DOES NOT MEAN YOU CAN CALL IT ARITHMETIC. I just spoke in caps to make you get the point. The deck seems much too slow and does not benefit from benefit from precise damage calculation based on weakness and variable attack forces at all like the original version. The sole variable part is Glaceon's damage spread but that is based on a coin flip and thus cannot be controlled on a reliable basis. If you are so obsessed with abilities denial why not just run Cessation while it is still available and save the troubles to obtain Glaceon. You need Glaceon as well as Espeon out same time since Glaceon itself is suspectable to a one hit knock out. IMHO, this isn't arithmatic. Arithmatic involved math moving damage counters around. This is just Eeveelutions/Banette. I don't see how useful Glaceon will be with Banette on the bench. It's not as fast as Banette is, and all that extra eeveelution stuff clogs up the bench, ruining the consistency of good banette decks. grrrrr....I need FIXES!!!! Not comments like, "oh, this isn't arithmetic" or, "this deck is soo inconsistant". Should I just take out the Pachirisus? Maybe add in the new Jirachi? Add in x4 Trainers instead? Once again, thanks for all the help you people. Understood the request. The main issue is that it would help us out a lot if you let us know what you want the deck to do in terms of strategic possibilities. The current Pokémon choice does not look like a true team. For me the issue came up what Glaceon is supposed to do for Banette or the other way round. Glaceon works for better with the new Froslass not released thus far or another stage one hitter able to deal 20 to 30 damage to two benched Pokémon. This combo would have some synergy. Banette and Glaceon do not seem to have that. Second: Most stage one decks excel due to their speed or a massive control factor. Pachirasu or any other starter slows down stage one decks. 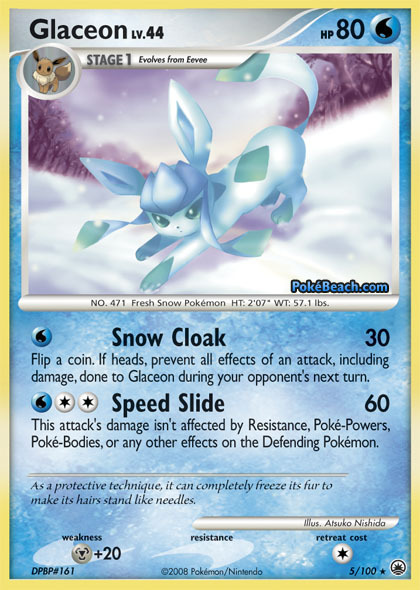 With regard to the control factor Glaceon is nice but needs support to maintain control. It merely locks down Powers when active so you need to ensure it stays alive (Espeon's job) and it can back up the Power denial control with another control mechanism. Bench damage control could work in this regard but none of the other Pokémon in your decks provide the deck with this feature. The draw and search engine looks small and slow too due to the massive amount of Pok´ßemon you chose. However, in order to provide more detailed hints on what I would alter or what others would alter it is necessary to know where you want to go with this deck in terms of it's tactical abilities. Hope this provides some initial assistance. Thanks for all your help Rayquaza14. I'll have to think about your changes. So are you going to put NOT ARITHMETIC in all of your titles now? Anyways you need mentor in here so you have more discarding cards. Flygon999, you have an amazing talent for butchering really good decks. ROFL the deck isnt like Artimethic yeah but the line needs work. I mean we have a thing called premier Ball,you can use it. Honestly a use for 2 Glaceon isnt that big to me,I mean premier balls can get him back from the grave and decreases pokemon.Just my input.